I’m really glad I took the time to attend this year’s iMoot, a web based international conference dedicated to Moodle, our beloved open-source learning management system. The 4 day event ran 24 hours a day to accommodate all time zones and was packed with excellent speakers and presentations. We all know that Moodle can do almost anything a teacher would ever want it to do. But how to organize that “anything” into a format that will be easy to navigate for students? Michelle Moore provided a nice set of Best practices in Course Design with clear and simple to follow guidelines. No fancy Moodle hacking or tech skills necessary, just simple tips that work. Michelle Moore also had a nice interactive session about the Workshop module, a not often used tool that supports peer-reviewed assignments. Michelle provided us with the opportunity to try out the module, which received a nice upgrade in Moodle 2.0, from the participant’s and teacher’s point of view - a great experience for all session attendees! For an introduction to the Workshop module, check out her presentation, and I’d also encourage you to play with the module on your own and see what it can do. Two years ago, I blogged about my idea of introducing some basic game mechanics to Moodle with a simple progress bar. I was really happy to see that Michael de Raadt had the same idea and actually turned it into an awesome Moodle block that allows students to keep track of their progress in Moodle courses. The block is very flexible, works with Moodle 2.0 Completion tracking and you can have multiple instances of the block in your course (e.g. for each week or topic). The first sample of students also seemed pretty satisfied with this tool, so I highly encourage everyone to give this block a try - you can get it for free from the Moodle Modules and plugins database. I was also impressed by BigBlueButton (BBB), presented by Fred Dixon. 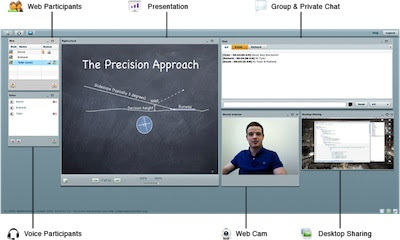 BBB is an open source web conferencing system with a clear focus on the educational market. They also put a lot on emphasis on keeping the whole thing simple to use, guarantee a simple installation and setup, and provide a nice integration with Moodle 1.9 and 2.0. I like the fact that they are not competing with Moodle, but rather trying to provide a quality product for supporting synchronous activities that you don’t usually get to do in Moodle. I’ll certainly keep an eye on BBB, and who knows - perhaps the next iMoot will be running on BBB instead of Adobe Connect. Moodle 2.0 comes with several new features and improvements to existing tools. But perhaps the single most potentially game changing feature is the addition of Community hubs, which were introduced at iMoot by Tomaz Lasic. In a way, Community hubs provide an open marketplace for Moodle course, but they also provide a space for collaboration. You can have your own private community hubs connecting just a few schools, or make your courses available to the global Moodle community by publishing them on the Moodle.org Open Community Hub (MOOCH). By connecting to a hub you don’t give away your user data and such, but just allow others to view or download your courses (your choice). You’re in complete control of what courses you want to publish and what kind of license you want to use. Go on, visit MOOCH and take a look at some of the first courses that are have already been posted! And oh, if you want to try out community hubs and other cool Moodle 2.0 feature, head over to Mount Orange Moodle 2.0 Demo site, where you can play around with a sample Moodle 2 installation in different roles. And below you can see an older version of Tomaz’s presentation - I’ll update it as soon as the new one with a more detailed explanation of community hubs is posted. 6) Biggest Moodle 2 mystery: Where are my course files? Mark Drechsler did a great job at uncovering the inconvenient truth behind the way Moodle 2 manages files. Gone is the course-centric approach to storing files, please make room for external repositories and resource based file system! It’s certainly a change that is making a lot of Moodle 1.X confused and frustrated, but Mark does a great job at explaining why we should embrace this change. He’s certainly got me convinced! If you’re switching from Moodle 1.X to Moodle 2.0 and still can’t wrap your head around the new approach to files, I strongly recommend Mark’s presentation embedded below or a visit to Mark’s blog, where you can find a more detailed explanation. It really wouldn’t be a a real Moodle Moot without a Martin-note - a keynote by Martin Dougiamas, the founder of Moodle, who is still actively managing the whole project. He shared hot info and thoughts about current Moodle development and future plans, and he also took the time to chat with attendees and answer all our questions (he’s incredibly friendly!). Martin is looking forward to teachers sharing courses through MOOCH and other community hubs that will enable global connected communities of learners. If all this great content hasn’t yet convinced you that attending next year’s iMoot is a must, I also invite you to read part 2 of my iMoot 2011 report, in which I’ll describe the overall conference experience in more detail.